So now they are signed, bound, and will be in the stores at Barnes and Noble this February 25th. I honestly don’t know if they will be divvied up and shipped to individual stores or simply hanging in the warehouse to fill internet orders, but if you want to get in on the action, here’s the direct link. One of the reasons I agreed to this is because 1) I like Barnes and Noble, and 2) I hope this helps ease the frustration of me not getting out much past the Mississippi this year on tour. I’m so excited to be able to offer both options for you. The prices vary, and I know that’s important. I ordered a signed copy from Nicola’s. I am still going to try and make it to the Raleigh event though! Thank you so much for signing books for us. I an hour away from one of your East Coast stops, so I hope to see you in person! I am afraid of asking b/c I don’t want to jinks any thing, but are there contingency plans in place in case of bad weather? Also, I work in a library and I was wondering — Have you ever gone into a random library in your travels to see if they have your books and then signed them? It would be really cool if you did! You could even put a quick note about just dropping by. Thanks for offering this from B&N. I ordered Ever After from Nicola’s last year and never received it! I just placed my order at B&N. Did I totally miss out on the tour t-shirt again? Crap on Toast if I did. I am so excited I can’t wait to get my hands on mine. Unfortunately I am disabled and I have to listen to the audio book version now. Is there a way to get a signed copy in that version? I went to both purchase links and I did not see a place. Please pretty please! I think I will give that a try! Thanks for your response. I absolutely love all your books! I wish you could sign ebooks! There’s a app out there that lets me sign copies that you purchase right there and then, but I’m still waiting for the app that lets me sign copies already purchased. Soon, I hope. I love Barnes and Noble, have my Nook HD ebook already preordered but I also love the little book stores and have order from Nicola’s too. Hi Ms. Kim I have been feeling well enough to go through Amazon Store on my Kindle Fire HD and ran into an author who writes in urban fantasy, among others,and uses a really great nom de guerre,Willem Hopfrog Pugmire he’s good, but not as flexable as you, he is into Cthulhu only, instead of encompassing a whole world like you do.I think Lovecraft is great, but concentrating on just that is limiting. Since your books encompass worlds and how they work your writing is much better. As soon as my head feels better, I’ll start again.Concentrating on a page still gives me a headache. Ooh nice! I did see this about a week or two ago and I couldn’t click preorder fast enough because my hands were shaking!! Thank you so much for letting us know about this! 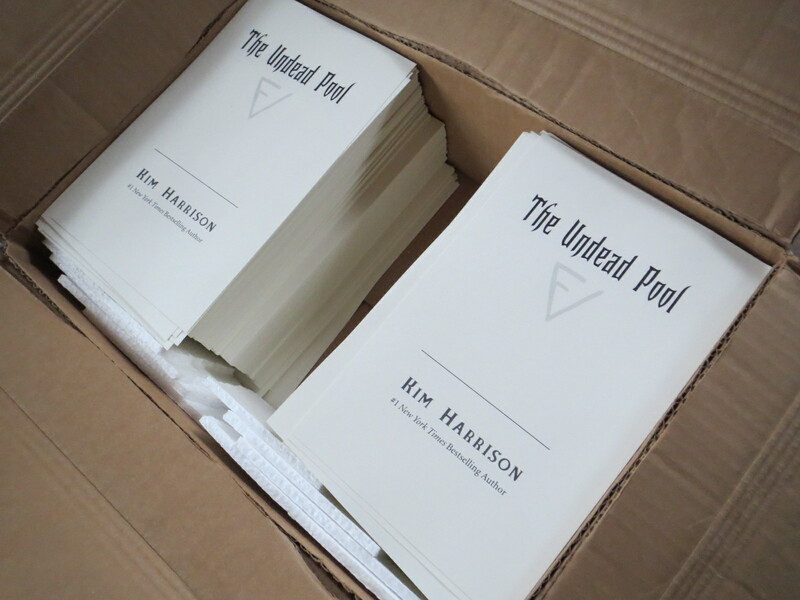 Can’t wait to tell my son I used the gift card he gave me at Christmas to get a signed copy of The Undead Pool! Gosh, Torvar. I feel lucky I get two stops in Michigan. It’s a lot of U.S. to cover in two weeks. Grr I have just ordered through Barnes and Noble (to the UK) but would have gone with the personalised option. Serves me right for being impatient! I ordered! I was lucky to win one of you give a ways and will now have 2 hardbacks and 2 paperbacks signed. What can I say…I LOVE your books!!!! I saw the link on FB yesterday. Ordered immediately. Thank you. why do you avoid book plates? Book plates are like cheating. An author can’t control where they end up. Thanks for expanding my knowledge, Martin. I think some authors are OK with bookplates, others are not. In any case, that’s a lot of signing? Do successful authors take a class in avoiding writers’ cramp? The reason I like signed books is because the author has touched it, opened the spine, left an invisible mark just by holding it. Book plates lack that magic. But I’m funny that way. There’s nothing wrong with book plates. @Kim that is a really a sweet/great way of describing it! And will you personalize it when you come to Atlanta Kim?